Lithium Phosphate batteries are a relatively new technology when it comes to industrial batteries. Lithium Iron Phosphate formulations have proven to be safe and highly effective for energy storage applications. However, there are certain safety considerations to be aware of when it comes to handling, shipping or storing these types of batteries. While it’s rare to occur, low-grade industrial lithium batteries without a proper BMS (Battery Management System) can be prone to igniting or exploding if overheated or damaged. By using high-grade batteries with correctly designed Battery Management Systems and adhering to basic precautions, lithium technology based batteries are extremely safe to use. 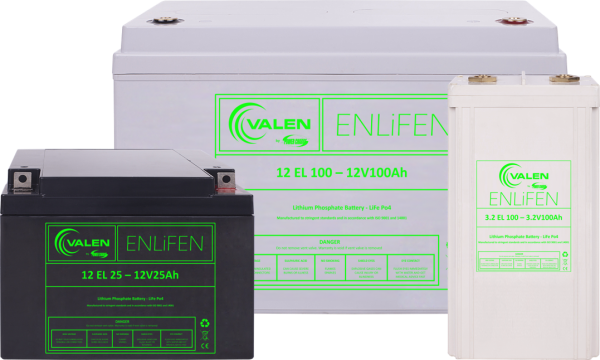 In this blog, the industrial battery experts at Valen take a look at some important safety advice for handling lithium batteries. It’s important to note that the following precautions should be exercised in addition to standard safety measures for handling VRLA batteries as well as any extreme precautions recommended by the Lithium manufacturer of your product. For more info on this, click here to read our blog on How to Safely Handle VRLA Batteries. DO NOT short circuit the battery. Whilst the BMS (Battery Management System) may be designed to handle peak current delivery, the initial discharge current could be very high and damage the internal cells. Never disassemble a Lithium battery or the internal battery cells. Disassembling may cause internal short circuiting within the cell generating gas, fire, and risk of explosion along with voiding the warranty. DO NOT incinerate nor dispose of the cells in fire. This may cause explosion of the cells. For advice on the recycling and how to recycle Lithium batteries, contact the experts at Valen. Battery or cell replacement should only be done by a suitably qualified technician. Do not allow the battery to become subject to any force which would cause damage. Do not use batteries or cells if physical damage is present. This may be evidenced by; deformation, leaking of the electrolyte, a gash or cut in the case, etc. Do not allow the batteries to come in contact with water or any other liquid. Any contact may damage the protection circuit resulting in incorrect charging and consequently causing overheating, explosion or fire. In the event of fire, if possible, move burning apparatus to outside. If safe, extinguish with plenty of water. Do not store, operate or charge a Lithium battery in areas where it could come in contact with a direct heat source. For example, on a window sill or near an operating machine. Always store and operate batteries out of the reach of children and animals or according to your particular manufacturer recommendations. Beware of fake or modified batteries as these may have missing components, such as the electronic BMS (Battery Management System), exposing the user to major risk. Mains Power Charging Lithium batteries: Always charge the lithium battery with a designed and approved lithium battery charger. Failure to do so may cause the battery to under charge, swell, rupture or explode. Solar Charging Lithium batteries: Always ensure that the solar charge controller or regulator has been modified to accept the lithium battery. Ensure your Lithium battery manufacturer approves. Always make sure there is adequate airflow available around the lithium battery when installing or storing as this will prevent the battery from overheating. A Lithium battery is customised, so it is best to ensure that the BMS is correctly specified for your application for maximum benefits and safety reasons. It is essential to ensure you have a low voltage disconnection programmed into the BMS on the battery. Without this feature the cell may be over discharged to an extremely low voltage rendering the cell useless. A thermal detection disconnect device, is recommended in case the battery does over heat for any reason. Need some extra advice on how to safely handle industrial Lithium batteries? Just ask us!